UV Coating Machine is suitable for UV oil and water-based oil.It greatly improve the surface gloss and prevent from dirt,moisture and wear effects.Especially UV oil treatment,the efficacy is the same as laminating and calendering treatment,without stripping,curling and light fading. 1. Adopts PLC control system and touch panel HMI for working parameters preset. 2. 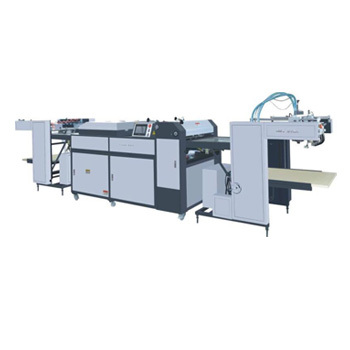 Adopts Automatic Paper Feeding System for continuous feeding,without any stop. 3. Adopts 3-roll reversal type coating to control the amount of coating effectively. 4. Speed is adjustable for water-based oil and UV oil. 5. Adopts UV light which is with safety cover. 6. Adopts resonal internable structure to prevent the leavkage of UV light. 7. Adopts Automatic Temperature Control System,electronic switch emergency stop and cooling exhausting device. If you have any enquiry about quotation or cooperation, please feel free to email to hatacmachinery@hotmail.com or use the following enquiry form. Our sales representative will contact you within 24 hours. Thank you for your interest in our products.